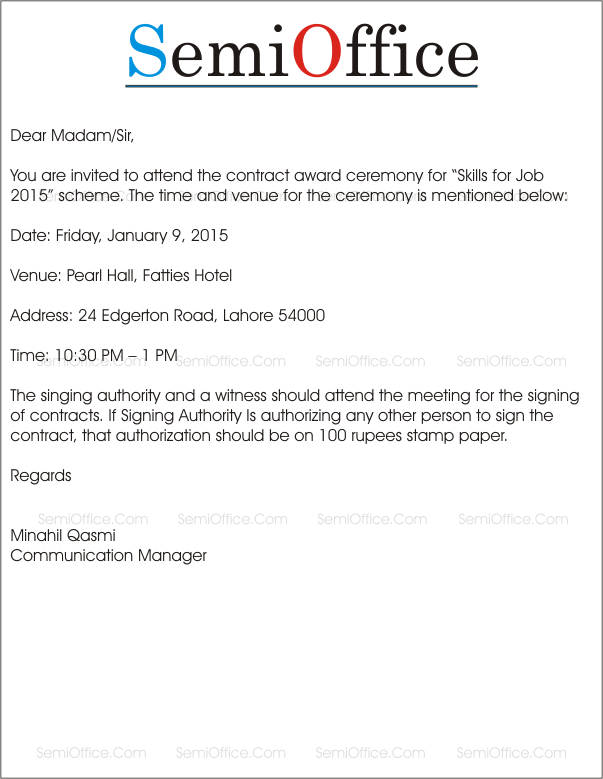 Sample invitation letter to attend award ceremony or visit to company to guests, clients, customers, suppliers, distributors, business partners and contractors etc. From the sample invitation letter you will also learn how to write invitation letter for the participants with schedule of the ceremony or schedule of program. 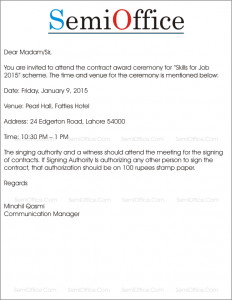 The signing authority and a witness should attend the meeting for the signing of contracts. If Signing Authority Is authorizing any other person to sign the contract, that authorization should be on 100 rupees stamp paper. Hope you are fine. As per our discussion on a phone call we welcome to the Senior Officials of OBTC to visit our organization on Saturday at 10AM or 11AM but the students and teaching staff will not be available on that day. If you can arrange the visit on any other working day of next week at same timing it will more purposeful. Because on working day the students will be in their classes, teaching staff and other trainers will also be available.